Having created art since childhood and learning from several recognized sculptors and painters, John’s works have appeared in local, state and national shows, with several art museum exhibitions to his credit. Whether you like oil, acrylic or mixed media paintings, sculpture, 3D art, or even uniquely styled furniture and decor — John has created it with a coastal consciousness as the common denominator. It all began in kindergarten when John’s grandfather first taught him how to draw horses. When surf fever struck years later, horses quickly became waves. When the surfing craze hit in the ‘60s, John was on his way. At the age of 10, he crafted his first surfboard with the help of his brother. It was too cold to work in the garage, so his mom reluctantly allowed the boys to work in the family dining room, vowing to never let it happen again because the house stunk for weeks. Little did they know, mom’s generosity would help start John on a journey that would mold his art — and his character. Professionally trained in fine art at the University of Houston, John also received his degree in business, recognizing early on that marketing would be one of his most valuable tools as an artist. Through the years, John's artwork has moved from the top of a gliding surfboard to his painting studio in Corpus Christi, Texas, near the warm Texas Gulf Coast waters. It is here where he continues to meld his artistic skills and knowledge of the ocean to create dramatic and fantastic depictions of his coastal experiences, using his divinely inspired creativity to express his life-long love of surfing and the oceans. John’s one-of-a-kind sculpted surfboards are one of his more iconic mediums. From vintage surfboards crafted 50 years ago by master board builders to today’s modern surfboards, John chooses to transform only the most eye pleasing hull designs into art. The board becomes the art rather than simply a canvas, a way to honor the sport and the history of the board through his unique talent of board building, sculpting and painting to create artistic depictions of the coast and surfing lifestyle. Never losing the passion to work with his hands, over the years he has helped build boats, repaired surfboards, worked as a commercial painter, a purchasing agent, a salesman, and even a kitchen designer and builder. His many skills allow him to create unique art, drawing from a quiver of many arrows. Surfing is an art, a dance on a moving canvas of saltwater. The board is like a brush the artist uses to create calligraphy of dance on the moving, liquid canvas. When the dance is completed, the human and the board endure and the canvas dissolves on the shore. Known to his longtime friends as OB1, John does a lot of charitable work for causes he believes in. John headed to the gallery with a board named Abby. Don’t feed the artist — or put a lounge chair with wine in the gallery. 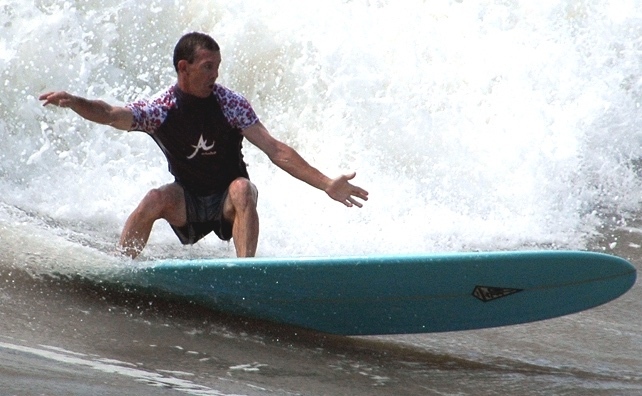 Having won three national amateur surfing championships, John is still at home on the waves.